I was recently asked by a close girlfriend of mine to make an 8" fondant cake and a larger sponge cake for her daughter's 9th birthday as well as her first holy communion. The event was last Sunday and would be held at the church premise after Sunday mass. After thinking about of a design that would be nice for a little girl, I settled on a garden theme. And for the larger cake it was a vanilla sponge cake with sliced fresh strawberries in between the layers covered with fresh whipped cream. The strawberry cake had great reviews because it was extremely soft and light. I had to run to a couple of supermarkets just looking for strawberries … luckily I managed to get some as they are currently off season. I had even thought about using frozen ones but it would likely have compromised the texture of the cake. The fondant cake was a banana chocolate fudge cake which I had made on several other occasions. I added another half of the recipe to enable me to bake a two layer 8” cake which suited this order nicely. This particular recipe is absolutely easy to put together. You just need to weigh out all the ingredients and then incorporate them together in one large bowl. I didn’t even have to take out my cake mixer for this job – a wooden spoon or a whisk (which was what I used) will do the job. Don’t get thrown off if the batter looks watery .. it’s suppose to be like this. This will result in a very moist fudgy cake. 2) In a large bowl whisk together the sugar, flour, cocoa powder, baking powder, baking soda, and salt. Set aside. 3) In another large bowl, whisk together the eggs, mashed bananas, water, milk, oil, and vanilla extract. Add the wet ingredients to the dry ingredients and stir, or whisk, until combined. You will notice that the batter is quite thin. Pour the batter into the prepared pan and bake for about 35 to 40 minutes or until a toothpick inserted in the center of the cake comes out clean. 4) Remove from oven and let cool on a wire rack. When completely cooled, frost with the Ganache. 1) Place the chopped chocolate in a medium sized stainless steel, or heatproof bowl. Set aside. Heat the cream and butter in a medium sized saucepan over medium heat. Bring just to a boil. 2) Immediately pour the boiling cream over the chocolate and allow to stand for 5 minutes. Stir until smooth. When Ganache has completely cooled, beat until soft and fluffy. Then spread the frosting on top of the cake. Jo, Very pretty decorations and so suitable for little girls! 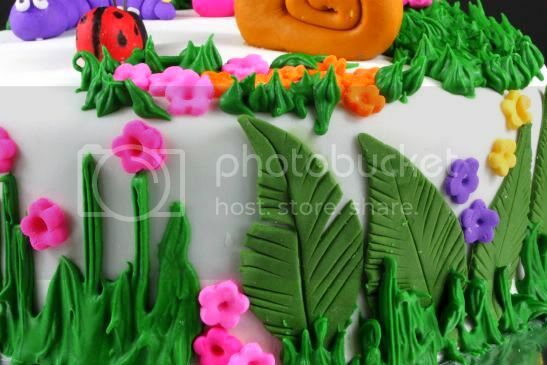 Jo, the cake is so cute, I love this garden theme :). What happy colours! This is a pretty cake indeed! Jo this is such a sweet looking cake. ;) I bet the little girl loved this cake. This is gorgeous Jo! Must've taken quite a while to do it. Nice work, very neat. Jo, the cake is very cute. Great job! Jo this cake is sooooo cheery and I love the colours!!!! Great job! Jo, I am in awe! 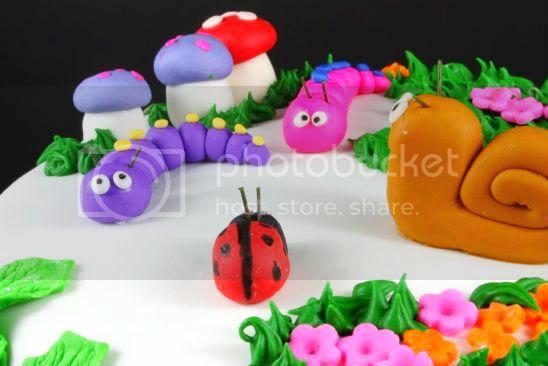 I have to admit that I had never known that you are so impressive with Fondant cakes! I was just reading about a christmas cupcake recipe that requires a fondant decoration... I may just give that a try and I will have to come to you for fondant advice, for sure! That is one amazing cake. I wish I had your talent. My family would absolutely love me. Just a beautiful cake and how pretty the garden is. So cute. So so cute! The cake looks gorgeous and colourful! 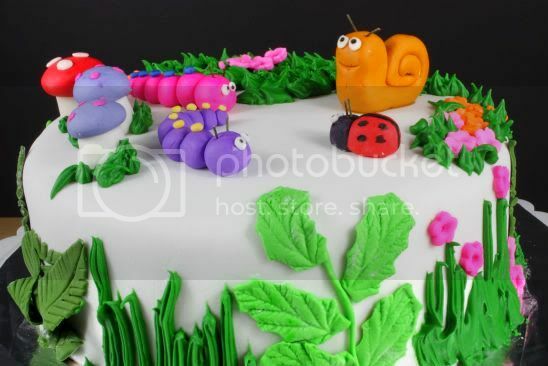 I have to think of a design as well myself, since my husband's birthday is coming soon and I want to make him a cake:). Jo, kudos to you! The cake looks really impressive! 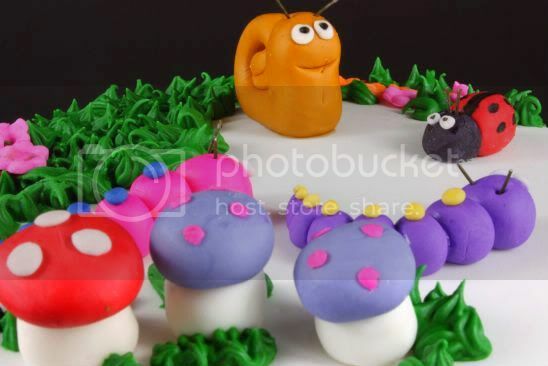 A fun theme you've got there for the fondant part! I bet the girl loved the birthday cake you'd made her! Love those decorations. Beautiful presentation. OMG- it's adorable. I love the little creatures. It's perfect! That's so pretty! I guess I won't have a chance to try my hands on fondant as my kids very much prefer sponge/chiffon cakes over dense cakes. Awesome decorating job on the cake, Jo! I have to tell you I scrolled through your latest posts and your photos are absolutely gorgeous. They are so clear and crisp. The compositions are also terrific. Pretty with out being too "posed". The cake is so beautiful! I am going to try your banana chocolate recipe and will also be using it under fondant. Is this recipe fluffy or dense? Hi Amy, it is a super moist cake. Not dense at all. In fact most of the cake recipes in my blog are moist and soft. I am not partial to dense cakes at all. Hi Jo, I'm interested in making your choc banana fondant cake for my sons first birthday and came across your recipe. I was planning on making the cake in two tiers. I love your cake and was wondering would if it may be very soft and if it is would it be suitable to use in two teirs? Hi Jo, I'm have thought of using chocolate ganache under fondant but I'm worried that the ganache will go bad since Singapore weather is so hot. Reading your post, it seemed that you have no problem with it. Do you frost and cover the cake with fondant 1 day before the actual day? And then leave it at room temperature (with or without aircon)?